Our Teammember Alexander Schulz has once again set a new world record in slacklining. 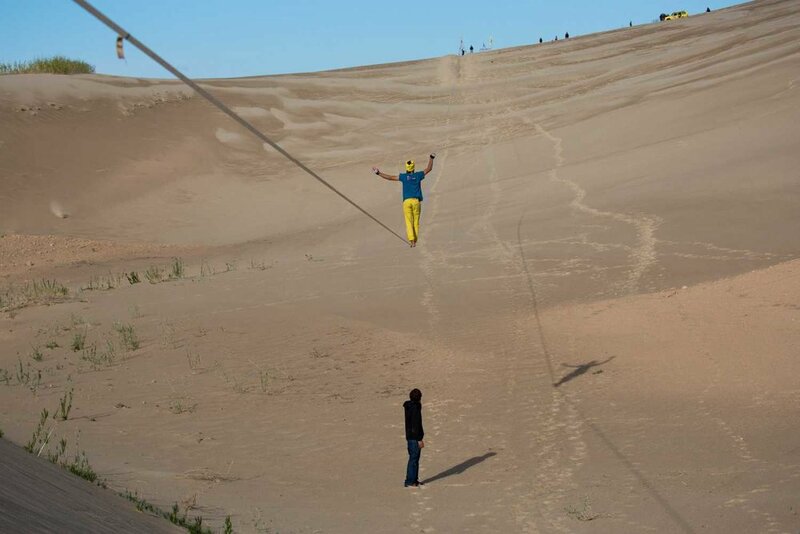 The 23-year-old walked a 610 meter long slackline, which had been rigged between two dunes in inner Mongolia and thus he set a new world record in slacklining. Never before had such a long slackline been ever rigged nor walked. The reason for going back to the Middle Kingdom was an invitation by the German embassy in Bejing. The team of One Inch dreams rigged a highline from the roof of the embassy to a crane, which provided an unusual attraction for all the guests there at the open day. Once in China, the group wanted to use the opportunity and rig further slacklines at special locations. 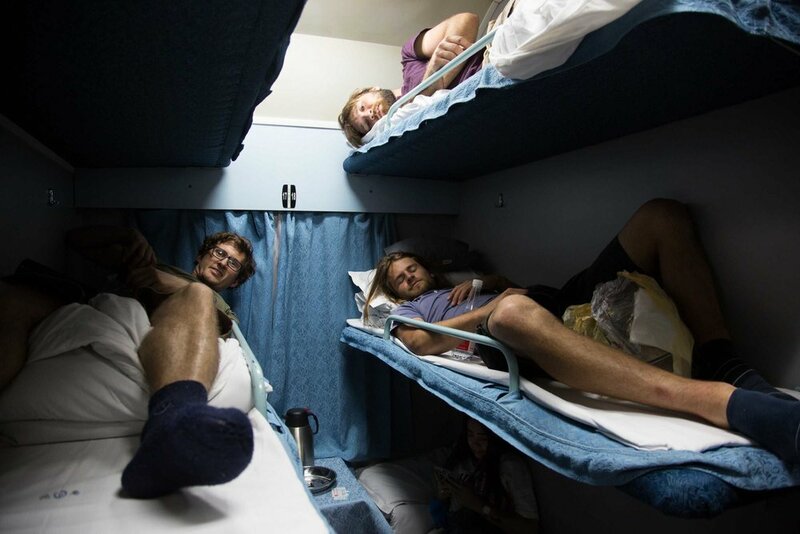 So they traveled again to Yangshou, where the highline record had been set, and to the leisure park of Changsha, where a 140 meter long lake was crossed on a slackline, passing spectacular water fountains. Unfortunately this desert in northern China didn't return Alexander's declaration of love at first. “This is the most extreme longline rigging I've ever done!” Alexander had to shout against the gale-force winds, which were blowing fine sand into their noses, eyes and ears. 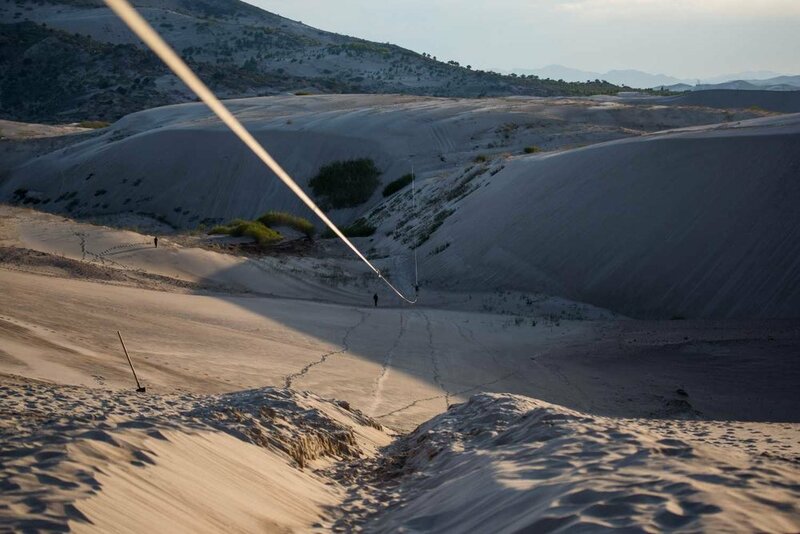 Putting down the slackline across a dune valley thus becomes a show of strength. We didn't consider giving up. After all looking for the perfect spot had been very time consuming. Everything must be perfect if you want to rig a slackline that is 600 meters long. At other parts of the line we were drenched in sweat working hard. “ The problem is that there is probably no spot which is a hundred per cent perfect” says Alex. “At the moment it looks like I could be touching the ground at some points, but at other points in between I may stand many meters high above the ground, as the area is not level.” So he and his team tried hard to clear away some high dunes. Shoveling against the forces of the desert – the work of Sisiphos! On the next day the wind had calmed down. The sun was shining and Alexander set out to try out the 610 meter long slackline, which was specially made by his sponsor, Elephant Slacklines. “On the line you must be completely at peace with yourself.” Alexander explains. “And you try and concentrate to be in the very present. Muscles don't count so much. What is more important is the so called muscle memory: Your muscles remember how to react and in this way they always do the right thing to balance the slackline." The day of attempting the record has come. The conditions aren't perfect, as there is some wind. The team have put some light weights onto the line every one hundred meters in order to avoid it from going up and down too much. Five times Alexander steps on the line, five times he has to leave it early. Now the time has come for the final attempt. It is Alexander's last chance of sending the line. At about 19 hours local time, shortly before sunset, Alexander is feeling his way forward on the 2.5 centimeter wide line. He's been on his way for an hour already. When he reaches the 600 meter mark, the excitement of all the people around him is growing. He himself is perfectly concentrated until the very last step, he feels like walking in a tunnel. Then the final step has been made and he embraces his teammates. There is champagne. says the new world record holder. “Something inside relaxed and it was easier to go on again.” Alex will probably not be able to rest for a long time, as there surely will be new adventures to come. However, today they are celebrating: here and now. With great team spirit, lots of preparation and a fantastic athletic achievement Alexander Schulz has managed to overcome his personal limits. Thanks to Elepant Slacklines, Honglei Outdoor Club and all other chinese helpful friends and everybody else we forgot right now!